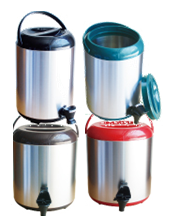 Description: Used for storing and keeping brewed tea at a constant temperature. Description: For covering the insulated container. Description: Sturdy, clean and clear container used for creamer, sinkers or toppings.